Fuel up at Phoenix Petroleum stations and win as much as P10,000 worth of Phoenix fuel and lubricants. Every P300 single or accumulated fuel purchase at any participating Phoenix stations nationwide entitles customers to one peel-off coupon for a chance to win minor prizes of P20 or P100, or the major prize of P10,000 worth of fuel and lubricant products. Customers must present their receipt/s to the forecourt attendant to collect their peel-off coupon. Receipts can only be used once. Any excess amount on the receipt/s shall be void and cannot be used in the next redemption. Receipts for accumulation are valid only at the branch where the transaction was made. Only receipts within the promo period are valid for redemption. Minor prize winners may immediately claim their prize at the Phoenix station where they earned the coupon. Major prize winners must call the Phoenix hotline 1-800-10-PNX FUEL (769-3835) or visit www.phoenixfuels.ph/GasPaMorePromo for details verification prior to claiming their prize. Peel-off coupons may be redeemed up to 60 days from end of promo period. 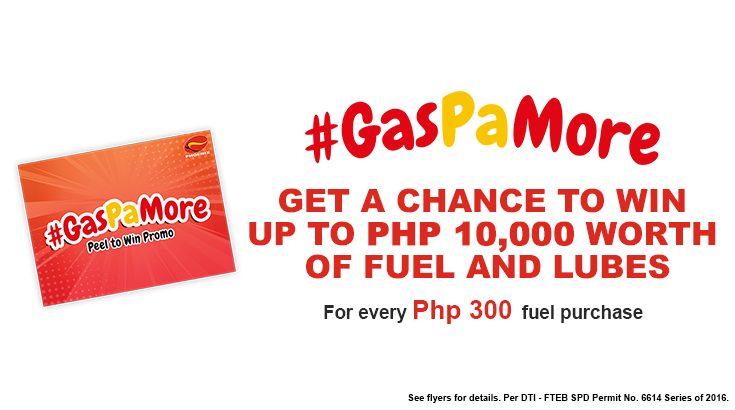 The #GasPaMore Peel to Win Promo is applicable for cash and credit card fuel transactions, and runs from August 1 to 31, 2016.